The Congress took India into 21st century, while the prime minister today is taking us backwards to medieval past when people are butchered because of who they are, Rahul said. 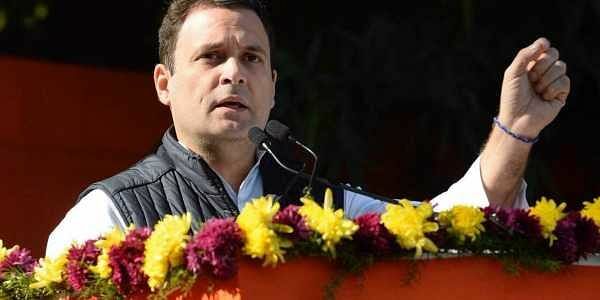 NEW DELHI: In a generational shift that ended the Sonia Gandhi era in the Congress, her son Rahul Gandhi on Saturday took over as the new party President and launched a sharp attack on Prime Minister Narendra Modi accusing him of taking the country "backwards to a medieval past" where people are butchered because of what they eat and believe in. The handing over of the mantle of the leadership of the 132-year-old party took place at a ceremony on the lawns of the Congress Headquarters where Central Election Authority President Mullapally Ramachandran presented the Certificate of Election to Rahul Gandhi in a ceremony watched by Sonia Gandhi, Manmohan Singh, Priyanka Gandhi Vadra and other top leaders of the party. "The Congress took India into the 21st Century while Prime Minister (Modi) is taking us backwards to a medieval past where people are butchered because of who they are, beaten for what they believe and killed for what they eat. "This ugly violence shames us in the world. Our country, whose philosophy and history is born out of love and compassion, is tarnished by such horror and no amount of hugs can repair the damage done to this great country of ours." He said the country was now being compelled to imagines that businesses can be built without harmony and "that only one man, one man himself - is the voice of reason, that expertise, experience and knowledge can be cast aside for personal glory, that it is acceptable for our foreign policy to lie in tatters so that one man can feel strong, and that everything in fact is subservient to the leader's personal image". He said many of the countrymen were "disillusioned by the politics of our time" as "today, politics is devoid of kindness and truth". "Today, the BJP is trying to spread fire and violence in the entire country and only one power can stop this. That is the Congress worker and leader. They break and we bind. They set fire and we douse it. They create anger and we create love. This is the difference between them and us. And I want to assure you that Congress workers and leaders, that you all are my family, whether you are a youth or an elder, wherever you come from, you all are mine, and I will give you all my love." In an apparent reference to Modi's "Congress-free India", Rahul Gandhi said the Congress considers the BJP its brothers and sisters even though it doesn't agree with them. "They want an India free of Congress, they want to erase us but the Congress' inclusion and respect for all Indians extends even to the BJP. We do not fight hate with hate. The Congress has met and will always meet our challenges and struggles with love and affection. They crush voice, we allow the most vulnerable to sing. They defame, we respect and defend. "They might control the structures of power, the machinery of silence and fear but, we in the Congress, we are the bastion of the people. It is in this service that my idealism, your idealism and our hope for politics always rests." The Gandhi scion's formal takeover comes two days before the counting of votes for Gujarat and Himachal Pradesh elections, the outcome of which could be a trendsetter for the 2019 Lok Sabha election. His main challenge remains the revamping of party organisation, apart from electoral battles in the run-up to the 2019 Lok Sabha polls. Sonia Gandhi, 71, who helmed the party for 19 years, in her last address as the party President, said the Congress has been playing the role of opposition since 2014 and never before has it faced the challenge that it faces today. "The fundamentals of our Constitution are under attack, our party has lost several state elections. But an exemplary energy fires our Congress workers. We are not the ones to bend in fear, because our struggle is a fight for the very soul of this nation. We will never retreat from this fight." Referring to the time she took over as Congress President in 1998, she said the party had only three governments and was far from a government at the Centre. "Meeting this challenge was not a marvel achieved by any one individual... India is a young country. I am confident that with a new and young leadership our party will be reinvigorated and bring about the changes we need." Talking about Rahul Gandhi and challenges he faces after his elevation, Sonia Gandhi said it would not be suitable for her to praise him because he is her son. "But this much I will say -- while from his very childhood he has borne the very experience of violence, the savage personal attacks he has confronted since entering politics have served to make him a brave and strong-hearted man. "I am proud of his endurance and firmness. And I am confident he will lead the party with a pure heart, patience and devotion." Manmohan Singh said Rahul Gandhi was assuming the new responsibility amid "disturbing trends". "As a distinguished academic pointed out a few days ago that there are dangers that the politics of fear will take over the politics of hope. Rahulji, we depend upon you to ensure that the politics of fear does not prevail over the politics of hope which this country needs. "He brings to this Office of the Congress President a new sense of dedication, a new sense of commitment, a new sense of looking after the leadership role with courage and humility." Outside the 24, Akbar Road, Congress Headquarters, a group of colourfully dressed artistes played drums and danced to Punjabi bhangra tunes with party supporters, including men and women, also shaking a leg or two and waving Rahul Gandhi's pictures and Congress flags.